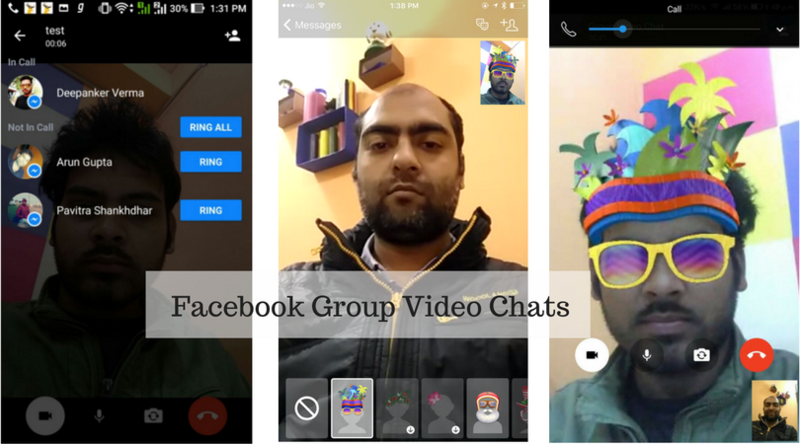 Earlier today, Facebook launched group video chat feature for the web, Android, and iOS. You can add up to 50 people in a group video chat. Before this, you could only do one to one video chats with individual contacts. Video calling is easy on Messenger and you only need to create a group and then ring all members to join the video chat. In this article, I will write the steps to let you know how to do group video chats on Messenger. Open Messenger app on Android or iOS. If you are on the desktop, you can open your Facebook account. Now create a group. I am sure you know how to create a group for group conversation on Facebook. If you are not sure how to make a group conversation, keep on reading. I will explain that as well. If you are on the desktop, clock on compose message icon at the bottom right side of the screen. It will open the new Message window where you can type the name of recipients you want to add in the group conversation. Now send a text and it will automatically create a group for group conversation. If you are using Android app, you see a big circle icon with a + symbol. Tap on it and select write Message. Now, type name of persons you want to add to the group conversation. If you are using iPhone or any other iOS device, you see a circle icon with + at the top right side corner of the app. Tap on it. In next screen, it suggests you add people to the conversation. Type the name of persons to add in chat and you are done. After you have created the group conversation, you will see the camera icon in chat screen at the top. It is there for Android, iOS, and the web. All the persons added in the conversations will be notified about the call. You also get options to ring individual or all persons at once. If you are using iOS app, you will have an extra advantage. You can use the MSQRD’s face masks within the video calls. This is how you can make group video calls on Messenger. Video calls to individual persons has already been there and now group video calls is another exciting things for users. With this new addition, Facebook will directly compete with Hangouts that has majority of share in group video calls. MSQRD filters are the primary advantage for iOS users, and we have no hope of seeing this on Android any time soon.